Top five visiting countries: USA, United Kingdom, Germany, Australia and my home country, Norway. Top five browser profiles: 53.58% Firefox, 40.38% Internet Exploder, 2.84% Opera, 1.39% Safari, and 1.34% Chrome (impressive, considering it's time on the market). I would think the most useful thing I blogged about in 2008 would be the "slick" integration between FCKEditor and Lotus Domino. Although FCKEditor is a bloated beast compared to some of the other Rich Text editors out there, it is still a great editor. I was probably most excited about my speedy templating engine. I still haven't released a demoapp due to laziness, and a couple more reasons. I have a feeling that the templating engine is a solution to a niche problem. I use it as a way to go beyond some of the restrictions of Views in Domino (being aware of the index of the document you're rendering, what level it is on, etc, and rendering different output based on that information). Templating engines are becoming less important/need to be rewritten when Domino 8.5 is released, and we have XPages. 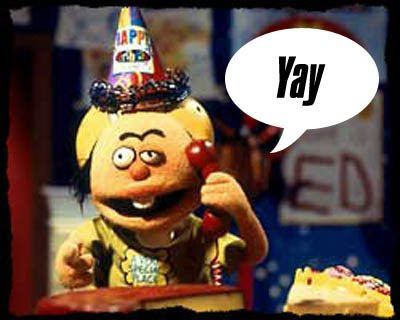 There really hasn't been much response to my templating blogposts. It could be because I haven't been able to communicate what benefits there are in templating, or that the problems I've had with Domino/Views aren't common problems. I've still to publish a demoapp of the improved templating engine due to above mentioned reasons. If I get really motivated/someone motivates me, I may release a demoapp in 2009. The beautiful URLs experiment got dropped once I found out that the technique generates a lot of errors in the domlog. Maybe XPages will make the URLs more flexible (it would be great to be able to map URLs per application/in the NSF). If everything goes as planned, I'll be at Lotusphere 2009. The hotel is booked, and flight/conference tickets are paid for. I'll depart from Norway January 17. and return January 23. Hopefully I'll arrive in time for BALD! Blogging-wise, I'm becoming less and less motivated to do experiments. This is mostly because I can't come up with new, exciting (to me) problems to solve. With XPages and Lotusphere 2009, this will hopefully change. Expand "More", to the right of the search-field. Select "keep current order", then click Search. This tip is probably only valid for agents that run by document selection. We recently added clustering to one of our environments. This resulted in some replication conflicts/problems due to agents modifying (new and modified) documents on two servers. The simplest solution to the problem I could come up with was to add a computed field, originating_server, with value=@ServerName. Update: To avoid leading people on a harder track than need be. If your app is located on a single server/single cluster, use Run on -> [Your server] in the Agent Schedule settings. Or, as DiDu suggests, check if the agent is running on the Administration Server/stop it if not. Set the Administration Server in the ACL-dialogue, under Advanced. The apps I had problems with are all from the same template, running in two distinct environments (separate NAB/Notes domain). Just out of curiosity, I tried using a text-list as input for @GetField. It works. When a text-list is the input, a text-list of the field values is the output. The above code gives me a pipe-separated string of the values in the subject, com_unique and relation-field. I had a problem with save-conflicts today. In an app I work with, the users can modify the category a document belongs to from the document-editing interface. When the category is saved, all documents that belong to the category are updated with new paths. Sometimes, when a user saved the document after modifying the category, a save-conflict would occur (I couldn't recreate the save conflict in Firefox for some reason, only IE). It's probably undocumented for a reason (not complete?). 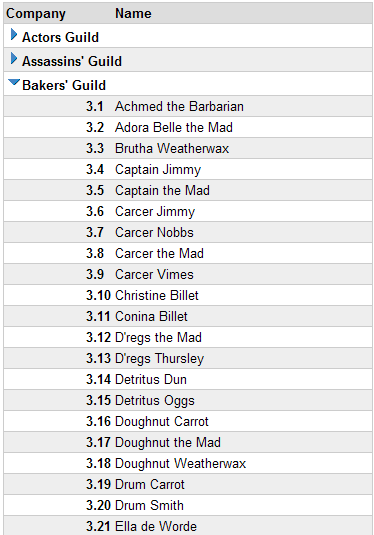 If you use this in a webapp, and run as web user, it ignores readers-fields, and returns all column values. This is similar to the LS Evaluate-behavior when you do @DbLookup/@DbColumn. Also.. If you do NotesView.FTSearch, getColumnValues returns all values, instead of only the ft-search filtered values. I don't work much with XML transformations. Therefore I don't have any commercial XML tools available at my place of work. I'm currently working with XML->DXL transformations. I scoured the web for some XSL tools. I found this nifty plugin for Firefox. It's fast, and works great. Highly recommended. 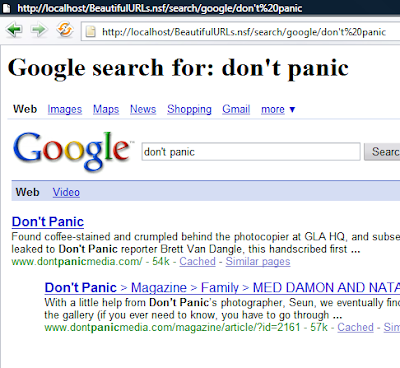 Inspired by the code poet, I added a google-translate tool at the top right side of my blog. Hopefully, this will let more people find a solution to their problem. Regarding the templating-class/-demoapp.. I've implemented it in a couple of projects at work. It works great.. I'll post the demo-app when someone (the tooth ferry fairy?) has documented the code. Just got a mail about a new version of the plugin. If you're not already subscribing to the RSS-feed, you should. Plenty of new content is being written at the moment. I decided to do some testing of the engine (currently in alpha-stage). At work, I mainly work on content management. One of our databases has ~5000 (5321) documents (content and categories). They reside in a CMS-type of application. The current render-engine (using LS/Forall) in the CMS can't deal with that amount of data, when printing the entire structure. After 55 seconds, the rendering stops with no output. Of course, the old engine isn't perfect, and it wasn't built to deal with that amount of data. When rendering the same markup, with the engine I'm currently working on, it renders in 2.3 seconds, with maximum data being processed in Evaluate (the more data formula can process in a run, the faster it runs). The resulting HTML weighs in at 704KB. Both tests were done on my 2GHz/2GB RAM laptop. I thought it would be fast, but this is way better than I expected.. If IBM upped the amount of data formula/evaluate could handle, the engine could probably render the structure in just above one second. Update: Did a little testing in N8.5/XPages (same markup as in the above tests). As other bloggers has mentioned, XPages are fast. What I really don't like about the current version in Beta2 is that you can't control if Dojo is loaded with the page. As far as I know, there is no way to make a regular webpage without client-side JS (Dojo). I hope they fix that in the final version. Hopefully they implement some kind of dependency-system. It loads what it needs for the widgets you use, then you can decide on the rest yourself (using checkboxes/etc). My search for the perfect templating solution for webapps seems to be neverending. In my latest concoction, I feel I've got a decent mix between readability, speed and flexibility. It started out with my feeling that using "readable lookup columns" was a bit to verbose/data-heavy for templating. I like pipe-separated column values, but on their own, in a template, they can be hard to read. In the demoapp I'm currently working on, I pick the field-labels (e.g. $name) from the first line in the lookup-column (fields := ...) using the Formula-property of NotesColumn. This way, I don't have to maintain documentation of the indexes of the different values, nor the position of the values. To get the most performance out of the rendering-engine, one more or less has to use evaluated formula-code. Iterating over an array of column-values using Forall/Replace is slower. It's more and more noticable the more documents/values one is putting through the rendering engine. If it's slow with one user, it's going to get a lot slower with hundred users/etc. If all you were rendering were static content, and have a decent caching-engine, performance per render would be less of a problem. My current solution is to join the array of column-values to a formula-interpretable-list. Due to Evaluate's limit on length of returned data, I have to process the data in snippets. All the templates are "compiled" to @ReplaceSubstring. You can see how I compile/process the templates and data when the demoapp is complete. Another downside to using pure LS-processing of templates is that it's hard to do conditional templating without slowing down the rendering-engine/writing a lot of code. Since all data are being processed by Evaluate/Formula, it's quite easy to add conditional compiling as well (@If condition -> conditionalTemplate ). If you want, you can use one template for all the data, or you can have multiple conditions, and a default template. At the bottom of the above HTML-files, you can see the amount of values/rendering-time. The time includes all processing, getting field-indexes, columnvalues, rendering, etc. The processing is done on localhost, on my laptop (Core 2 Duo 2GHz/2GB RAM) in Windows XP. I'm not done yet with the implementation. The current engine is comprised of two classes. One that renders arrays of pipe-separated values (could also process CSV-files), and a subclass that processes the columnvalues of a view. I plan to add another subclass to the first. This would let you use ft-search on a view, and sort the resulting columnvalues on a field/value in the resulting columnvalues. I can't say when the demoapp is complete. I'll probably have another update or two before the app is ready for the masses. In my previous post, I mentioned that I'd like to see Aptana in DDE. Well.. It seems that we're not far away. Nick commented that there is a project named Domino Developer Plugin for Aptana Studio. Aptana is quantum leaps better the integrated JS-editor in Domino. You get code complete for Js, DOM and JS-frameworks, etc. I've only tested it for fifteen minutes or so, but so far it seems excellent. One of my applications is more or less pure JS/CSS. Not having to deal with Domino Designer (Open/Refresh) is excellent. When you save, the change goes directly to the NSF. I had a little trouble with it at first. I added the Notes path to the PATH environment variable. But I got an error message whatever I did. I restarted the computer, and now it works fine. If you get this error message, "java.lang.UnsatisfiedLinkError: no nlsxbe in java.library.path" after setting PATH, then you probably need to restart your computer. Update 2: I've found one re-creatable bug in the current version. When saving a file-resource, the last character is cut. I've reported the error to Jeff. Hopefully he can get a fix out in the nearest future. From the documentation, it looks like you need two arrays to use ArrayAppend. In Notes 8.02, at least, you can also use this function to add single values at the end of a dynamic array (arrays created using Split, NotesItemValues, etc). I would think there would be a performance hit when dealing with a lot of values, but at least it's possible. If IBM would just give us the Eclipse Java editor inside DDE, I could finally stop dealing with the crappy array-implementation in LS. I've updated the HTTPRequest-class so that you also can use it to pick cookies of a request. Print "I've got your cookie!" Although I link to Jake's excellent demonstration of how simple it is to get the session cookie, I wrote the cookie-bit a couple of days before, in work relation. Sometimes it can be useful to render HTML from document collections. I believe one of the fastest ways to get values from Notes documents is using Evaluate. As a lazy person, I like to avoid writing formula code, as it's somewhat verbose compared to modern templating languages like PHP. To avoid this, make your own template interpreter using simple formula code. Result: "Date: " + @Text( dayOfMonth) + ". " + month + "." The result can be used in an evaluate statement. A great thing about templating is that it is very maintainable/reusable. If you want to change the output, all you have to change is the template-string. To generate XML and HTML from the same collection, all you have to do is to have two different string templates. The conversion logic can be the same. In the simple demoapp I've included, a collection of 300 documents is processed, extracting five fields. 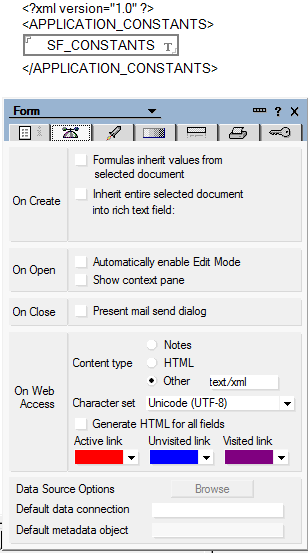 A HTML table row is generated per document. class="even"/class="odd" is added so that one can style odd/even rows. If you're somewhat familiar with LotusScript, it should not be hard to make a template-class to fit your needs. On localhost (my laptop) it takes about 100 milliseconds to generate the HTML/write it to a PassTruHTML NotesRichTextItem. In case you missed it in Yellowcast, episode five. There's an undocumented feature in Lotus Domino that lets you pull HTML from a RichText field. This is a very useful feature for me at least. I believe Carl Tyler was one of the first to blog about this. Why not document such a great feature? Why, IBM?! Problem: How to process documents in a category (categorized view) in a simple way? This is a problem I've heard a couple of times at work from the Notes-guys (I'm a Domino/Web-guy). I've tried a couple of approaches/googled, but found nothing. Therefore I archived this problem in my "experiment ideas"-folder. Today I had a little time to play around, and found a very simple solution. When you click an item in a view, a couple of properties is set in the NotesUIView. CaretNodeId points to the NoteId of the document that is selected. The gem is that when you click a category, an "invalid" NoteId is set. If you can't get a document from from the db using that NoteId, the item clicked is probably a category. Now you know the user clicked a category. Combining the ViewSelection-formula of the view, and the Formula-property of the first column (the column has to point to one field in the document for this to work), you have a valid search-formula for db.search. Now you know which documents the user want. Of course, the user don't want to modify documents by category each time they click the category. Add a button that sets an environment variable, and test for the value of that variable in the onSelect-event in the view. If you want to make available several types of action on the documents, use more values. As always, blogposts like this are useless without a simple demoapp.. If you like/dislike this workaround/hack, please leave a comment. Update: The onselect event is new in Notes 8. So if you're running on older versions, I guess there's no simple solution. Thanks to Theo for giving me a heads up! Domino (at least pre 8.5) doesn't let you use $$SearchTemplate forms as anything other than vanilla Domino-generated html forms. This makes it somewhat difficult to search/getting Json-data in return. I'm terrible at explaining code (terrible at explaining anything), so I've made a simple demo-app you can try. Remember to create a full-text index on the demo-db before trying it out. The app is tested, and works in Opera 9.5, FF3 and IE7 on Vista x64. I think I've cleaned up the demo-app good enough now. I added another demo, showing the browser on the onHelp event in Notes/offline Mootools accordion. Apart from that, I've changed the way I store JS. I now store it in a page, and use the NotesNoteCollection of the db to fetch it (look in the code). This makes it easier to implement in a Template-context. If you test the app on something else than Notes 8, I'd appreciate feedback (preferably in the comments) on the stability of the demoapp. 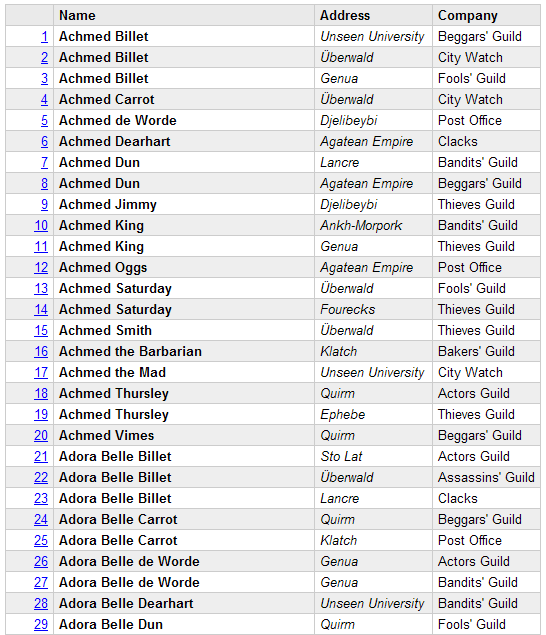 To test out making friends, edit a document in the DiscworldCharacters-view (make sure the HTTP-task is running). If you're running the demo on a server, edit the Add friend-button, so that the domain is correct. The other demos are in the BrowserDemo-form. Update: Martin tested the app in N6.53. That makes it at least compatible with N6.5 to N8.02. I'm more or less satisfied with what I've accomplished with my experiments. I'm now able to "bootstrap" (in lack of a better term) a JS-library/HTML to a WebBrowser control. This enables you to write truly offline widgets (no HTTP-task involved) for your notes-apps. I'm also able to bind LS-functions to the events available in the WebBrowser-control using environment variables and Execute. I won't be able to clean up the demo-app today. Hopefully I'll be done tomorrow if nothing else comes up. Until then, I've made another flash showing a youtube-movie inside Notes (for instruction videos/etc. ), and logging of navigation (for tracking of online wizards inside Notes/etc.) in the webbrowser using the BeforeNavigate2-event. If you want me to do make another example of integration with the WebBrowser-control, leave a comment, and I'll see what I can do. The demoapp has gone through serious a serious rewrite to make the code more reusable/flexible. I've also worked a little bit on dynamically binding events through environment variables and execute. Sadly I haven't found a way of truly dynamically binding events (On Event..). Some of the methods for the browser-class I use are now also chainable. E.g. 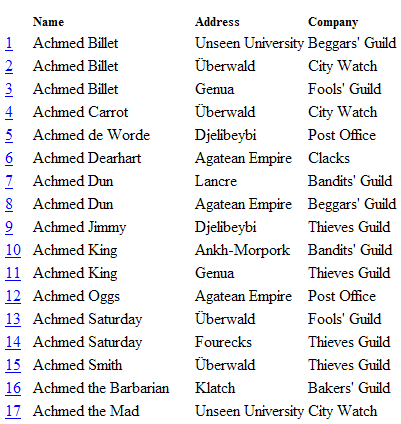 The document being edited has a hidden multi-value field that holds ID's to other "Discworld Characters". When a character is selected in the lookup, the id of that document is put inside a hidden field in the browser document. When the browser is closed, the values is picked out of the browser document and added to the "friends-list". Then the document is refreshed/a lookup is run to update the list of friends (a computed for display field). This is achieved by binding a function-call to the windowclosing-event of the control. I'm still not ready to release the demoapp. If I do that, I'm probably going to stop experimenting on the WebBrowser, and start mucking with XPages.. Joining in on the fun..
A form I'm working on gets a combobox (or select list, if you prefer) generated by a WebQueryOpen agent. The content of the combobox is generated on the basis of another field. 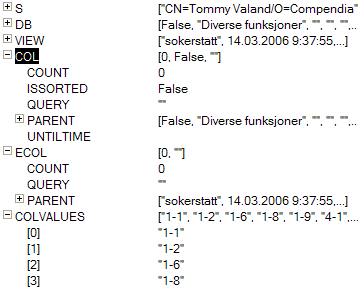 I use one combobox to select a db, then the second shows documents in the selected db. When I select a db, I want to generate the select list with documents in the selected db. I first considered running ViewRefreshFields, but WQO-agents don't get triggered by this. It seems that running agents with the ToolsRunMacro @Command keeps the form as it was before the running of the agent. The workaround, then, is quite simple. Add a hidden button (style="display:none") on the form. OnClick on the button, run the agent generating HTML (and ViewRefreshFields, if you need to refresh the form). Onchange in the db-combobox, click the button. If you've used a similar approach, and found weaknesses with it, please let me know in a comment. I've come a little farther in my experimentation. Today's flash show offline DHTML. The flash doesn't do the FX justice btw. When I'm done tinkering, you'll get to see the real deal. I put the mootools framework JS inside a RichText-item on a document. Fetch the js as a string. Write the string and some HTML to the WebBrowser-control. Hey Presto! Offline DHTML. Getting to know the object more and more. Today's flash shows capturing events from the browser-control, and picking values from the document inside the control. This resource from Microsoft has helped me along somewhat. Only a fraction of the methods/events/properties documented is available in Notes though. Update, 25.08.08: It appears I'm not the only one struggling with this issue. Jack Ratcliff had a similar issue. The difference being that he didn't have a document to process. Since all databases are required to have one view, and all design-elements basically are NotesDocuments, it's easy to rewrite the code to work without needing a "real document". I could use NotesDatabase.ReplicaID, but I prefer somewhat readable URLs. My solution was using evaluate @DbName (the path to the database), with a document from the db I was currently processing. Without the document as second argument, evaluate would return the path to the search database. I planned on getting a demoapp together today, but I had to find a workaround for showing/hiding the layer holding the webbrowser, and that took most of my time. Hide-when doesn't work properly with the WebBrowser-object. At least I want to show some fruits of my labor. A small flash animation showing scripting between Notes and the control/putting the WebBrowser control inside a layer. The promt/messagebox in the demo are Notes'. You can tell from how they look, compared to the browser's alert/prompt. I'll probably post a demoapp/more info when I have something more useful.. In the Open-dialog you get when you click New Image Resource, type *.png and press enter. Then you filter the "view" so that only PNG images show. You can use this trick to add other file-types as well. I've used this trick in other applications for years, and thought it was common knowledge. A colleague of mine wasn't aware of this the other day, so I thought I should share it with you as well. I don't know if this works on Mac/in Linux as I'm not familiar with their file system browsers. I've had some trouble recently with Yahoo trying to index links in a view that contains agent-generated documents. This gives the Domino-error, "Special database object cannot be located". All errors are sent to my mailbox (an error-folder). I try to remove as many error-sources as possible, to avoid having to read hundreds of mails, or even worse, deleting all error-messages because there are too many. Found a nice piece on avoiding indexing. I could filter/hide the view, but it's nice to have around for debugging purposes, and it doesn't contain confidential information. I re-read a slide from LS-08, and (re-)discovered a couple of new (and undocumented) LS methods in Notes 8. The methods should also be available in Java. Before you read on. The integration requires you to set DominoDisableFileUploadChecks=1 in notes.ini on the Domino Server. I found no satisfying integration-examples that included upload-support for FCKeditor, so I decided to try to make the integration myself. As far as I've tested, you can upload whatever you want, only limited by settings in FCK and Domino restrictions. Flash animation of the integration in action. Shows upload of an image and upload of a flash game. Although it was a bit hard to hack around Domino restrictions regarding uploading files, I finally found out how to make it work. The interesting bits are the fckconfig.js page, the demo form, and the fckupload form. Read Ferdy's article to understand how you can upload files to Domino without using a Domino generated File Upload Control. If you're not running the demo on localhost, DominoDisableFileUploadChecks=1 in notes.ini on the server. Tested with FCKeditor 2.6.1 in FF2.0, IE7(Vista) and Opera 9.5 (go try it out). I use both of these on a regular basis. I've printed them out on paper, so they're always withing arms reach. For web development, ILoveJackDaniels.com has a few nice ones (the site seems to be down at the moment). Had a case at work where I needed to make a breadcrumb-like thingy. The breadcrumb consisted of either two or three elements, and got it's values from form-fields. Instead of checking the fields for values, I put the values in an array, trim the empty values, and join the array with a separator. For those of you that haven't heard, in Domino 7.01, IBM implemented a workaround for (HTTP POST) request-content above 64k. I've updated the HttpRequest class, so that it handles requests above 64k automagically. The test-app has a page that posts ~260k of data to an agent. This results in 4 request_content fields. The agent prints a report of the request ( [HtppRequest].printHtmlReport ). Let me know if there are errors. I needed a function to test if a list is empty today. This is of course something IBM doesn't think we developers have to test for, so it's not in the LS API. Error 1001, "The variable tested is not a list"
Notes 8 Classic - working undercover? I just started using Notes 8.0.1 this week. Some things I love, and some things annoy me. I was working on a calendar-entry, when suddenly the classic client popped up. I can't close it by itself. When I close the standard client, this closes as well. Don't know if this means that the classic client is used as a go-between for Domino Designer/old Notes apps and Notes 8 Standard Client? Looks like we don't have to wait another 5-6 year for IE.Next. Bandwidth is still a concern for a big part of the web users. To save bandwidth, the simplest job is to compress the content that "never" changes. For instance JS-frameworks. There are a couple of approaches to this, "packing" utilities like Dean Edward's packer. This compresses the JS in such a way that it's still "compilable" in it's raw form. Another way is to gzip the file. This requires that the browser unpacks the file before it is sendt to the JS "compiler". I prefer to use both packed and gzipped JS frameworks in production. This guide will hopefully help you serve gzipped JS-files without too much hassle. The JS-lib I use in the accompanying demo, MooTools is 72KB "unzipped" (the version that is packed using JsMin). Gzipped, it's just shy of 20KB. 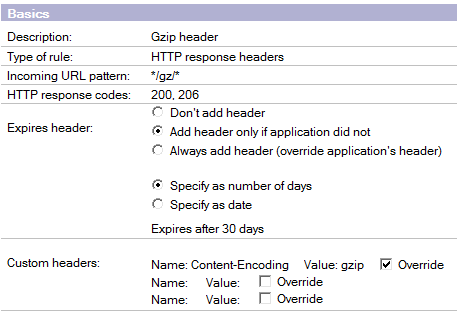 To enable gzipped content on the server, create a web site rule (requires restart of the HTTP-task). The above rule works like this: For all files in a subfolder named gz, the domino-server will add a HTTP-header, Content-Encoding, with the value of gzip. This tells the browser that the content it is downloading is compressed. At Compendia, where I currently work, we've set this as a global rule, as it doesn't affect any other content. To compress files on your machine, you need an application that can gzip files. I use gzip for DOS. Extract the downloaded utility to a folder of your choice. At work, I have it on c:\gzip. Copy the file(s) you want to compress into the folder you extracted the gzip-utility. Open command-line. cd into the folder you've extracted the gzipping-utility. Be aware of that the dos application overwrites the original file by default. With the aforementioned web site rule in place, browsers opening the gzipped file will get the correct HTTP-header, indicating gzipped content. What about users that doesn't have gzip-enabled browsers/etc? In the index-page of the simple demo-app, I compute the folder in a script-tag by the presence of Accept-Encoding: gzip header. @If( supportsGzip ; "gz" ; "lib" ) + "/mootools-release-1.11.js\"></script>"
>> Download demo-app with gzip for Dos/mootools compressed/uncompressed. PS! The index-page needs to run on a server with gzipping enabled, like in the picture at the top of this post. Either that, or you can run the browser in HTTP 1.0-mode. HTTP 1.0 doesn't have the Accept-Encoding header. I discovered this a couple of months ago, by coincidence (I actually read the documentation, instead of jumping to the example). 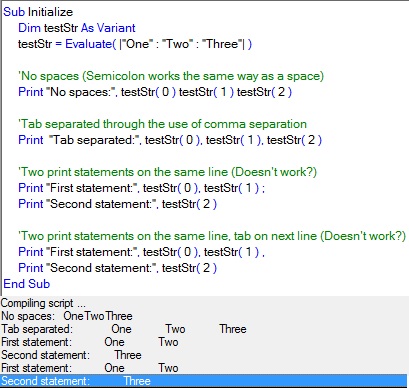 Semicolon or space in exprList The next data item is printed with no spaces between it and the previous data item. Semicolon at end of exprList The next Print statement continues printing on the same line, with no spaces or carriage returns inserted. I've started using the comma-separated syntax, when debugging, simply because it's less verbose/faster to write. I did a little test to see how the different "methods" of using Print worked. It seems like the semicolon/comma a the end of the line doesn't work (see picture below). Either that, or I've misunderstood the documentation. Update, 04.03.08: It appears I was fooled by Prototype. The Node-interface/object is not available in IE. From reading JS-code in different places, it doesn't look like many people are aware that there are constants for the different node-types in a HTML/XML-document. Which is ok, if you remember that 1 corresponds with element-nodes. The Node-interface in DOM level 1 contains a property/constant for each of the nodetypes. This technique is probably overkill on smaller applications. It's quite verbose compared to writing the values directly into fields/computed texts. Long living, ever changing applications may benefit using this technique though, maintainability-wise. Basically, the technique is a shared, computed for display field that you put in all your forms. This field may contain the names of lookup-views, index of lookup-columns, replica-id's, filepaths to co-existing applications, et cetera. Due to the nature of the readable lookups, there's no problem with inline comments in the field, or re-organizing the "constants". To extract a value from the field, you have to use quite a verbose syntax, but if the constant is used a lot of places, the added verbosity is worth it, as you only have to change the value one place, in the shared field. Since the constants are in a field, the values are also available to LotusScript when working with documents. Simple function to extract values in LS. Update, 04.02.08: It seems ReplaceItemValue on NotesRichtextItems is limited to dreadful 64k limit. Undocumented as far as I can tell. When storing HTML in documents, I've always done the .RemoveItem .. CreateStyle .. PassThruHTML .. CreateItem... body.AppendStyle ..body.AppendText..
Where "body" is the name of you RichText-field. The RichText-fields needs to be marked as PassThruHTML in the form. The easiest way to do this is to add a space before and after. Select space[RichText]space. Text -> Pass-Thru HTML. Simple demo-db to test the difference between saving the document with above code on WQS/no WQS. In the past, I haven't found another way to flush content in a RTI than to remove the existing, and create a new one. By standalone I mean that when you submit a form, you don't submit all the others/the main form. I decided to make this when I read a question in Jake's latest article, How to Embed a Login Form on All Lotus Domino Pages. The question is not directly connected to this blogpost, but somewhat. We are getting two HTML form tag in view source of page in browser, one form tag for main form and other which is login form. My question is, How will I handle when we are submiiting the Login form ? Will it submit the main form as well ? The demoapp loads another form using an iframe. Using DHTML I pick the form out of the iframe and inject it at the top or bottom of the form that is open. The reason for either top or bottom is that forms can't be nested (read Jake's excellent article for more info). If you want it in a specific position on the page, CSS may help you. The reason for iframe and not XHR (Ajax), is that XHR returns text. With the iframe, I can more or less pick what I want out of the "iframed" document, the way I would on the "main" document. While doing som googling today I discovered that NotesDocument.ReplaceItemValue returns NotesItem. The reason I haven't discovered this before is probably because I've been lazy, and used the "dot" notation. What I was googling for was actually advantages of using Get-/ReplaceItemValue versus the dot-notation. I've mostly used those two methods in loops, when the dot-notation would be horrid and evil to use (the copy-paste-then-edit-index-method). My quest recently is to create readable code, so I'll try using getters/replacers ( :| ) over dot-notation, and see how I feel about that. To the point of this post.. I discovered the return value in a comment to Andre Guirard's blogpost/article, GetItemValue and ReplaceItemValue vs. "dot-notation". In the newest version of the CMS I'm working on/maintaining, a couple of customers got strange errors. The culprit was that for some reason or other, their browser didn't accept gzipped content. The agent must run locally. This is achieved by [agent].RunOnServer. This is probably public knowledge. A thing I just discovered is that the database you're creating the index for has to contain at least one document. I stumbled onto this when working with an agent that creates a "history" database (empty on creation) from a template. Another application copies documents into the history DB when changes are made. The history DB has a search interface, and therefore I create the the FT-index. It's a simple workaround, create a dummy-document, create ft-index, delete dummy-document, but WHY should I have to do that?!? Update, 17.01.08: If you want to play it safe, follow Vitors advice to me (in the comments), and use versioning on the file-names of the scriptlibs. My experiment was fun, but it's bad to put the "responsibility" of handling change in the codebase, on the customer. At work today, a customer couldn't get the CMS I am responsible for to work properly. The reason being that I recently updated some markup and JS in the design-template for the CMS. The client had the old JS library cached in the browser. Due to the markup-change, a function in the old JS library failed, which resulted in a JS error, and things not working properly. This got me thinking on how to avoid this in the future/let the user know what failed, and if a caching issue, how to force a refresh. The downside to this approach is if you have several non-static JS-libraries on one page. You can't know which one is going to be cached, so you have to add the check to all of them. The accompanying demo application is a mess, but hopefully it's easy for you to play with. Tested in IE6/7, FF2 and Opera 9. This is somewhat related to my previous post, as that is what sprung this idea forward, adding a class-attribute per even row/colgroup-nodes per column, dynamically. In the downloadable demo application, I've made a $$ViewTemplateDefault-form with a JS-function that does the above, onload. Every even row has class="even". The generated colgroup is structured like this, a <colgroup> containing <col id="column[number]"/> nodes, where [number] corresponds to the column number it represents. To get a fix on the Domino-generated table, I've added a span around an embedded view (to easier control count). id="domino_view", class="@ViewTitle". I don't know what more to say than take a look at the screenshots, and download the app, look at the code/css if you think it's something you can use. Tested in IE 6/7, FF2 and Opera 9. Styling on a column level can be a really powerful tool to create great looking tables. I'm no designer, so I can't show you how to create great looking columns, but I can show you the points of attack. By using only "one point of attack" in the markup per column makes for leaner pages. 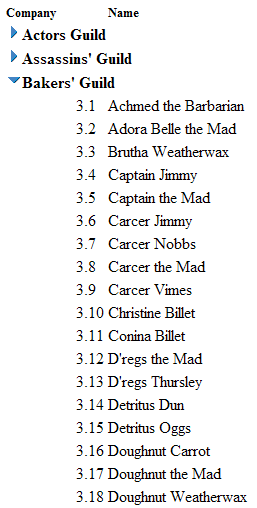 By that, I mean that you could put a class on each td (first, second, etc) on every row, but that isn't really necessary, and with big tables, big html. Internet Explorer supports a lot of styling opportunities with the colgroup element. With Firefox and Opera (not sure about Safari), you can only apply a handful of styles using this element, but on the other hand, they fully support CSS 2.1 which has some really powerful selectors. To get a reference to specific columns, I use the :first-child selector, and the adjacent sibling selector. For more columns, simply add + td per column. The reason for the redundancy is that IE6 seem to ignore styles that uses the above CSS 2.1 selectors, instead of ignoring the selector. To remove the redundancy from the rendering engine of the browser, you could exploit the star html bug in pre IE 7 browsers. 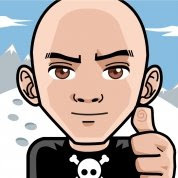 Add * html before each colgroup-styling. Then the rendering engines of IE 6 and older browsers see those styles, whereas modern browsers only see the CSS 2.1 selector styles. Comments, critique, etc. are as always appreciated! The blog started off with a small post, January 17. 2007. When I started the blog, I thought I'd mostly post about Web/Domino-stuff. As the year progressed, I believe I ended up with more Notes content than Web content. My idea-well isn't as full as it was half a year ago, but hopefully I will be able to find/create something useful to share with you in 2008. Instead of posting my favourite posts of the year, I'll leave you with the most visited content. On a more personal level, the highlight of 2007 was definitely my trip to South Korea.